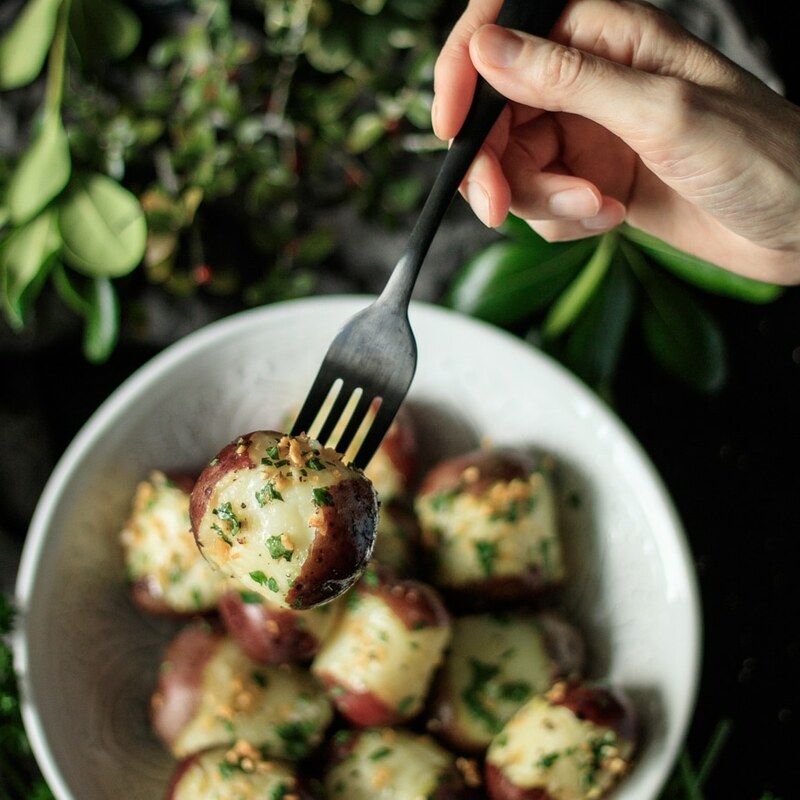 In this easy recipe for Buttery Garlic Parsley Potatoes, new red potatoes are boiled on the stovetop and tossed with brown butter, sautéed garlic, and fresh parsley to make the ultimate gluten free, comfort food side dish. I first tasted parsley potatoes seven years ago when a dear friend was instructing Busy Baker 🍞 in French cooking. Since the dish was simple, it was frequently repeated at future French cooking lessons as the go-to side dish to serve with that evening’s new main course recipe. Try as I might, I couldn’t find her recipe, but the one I devised is fragrant, buttery, and lip smacking good! 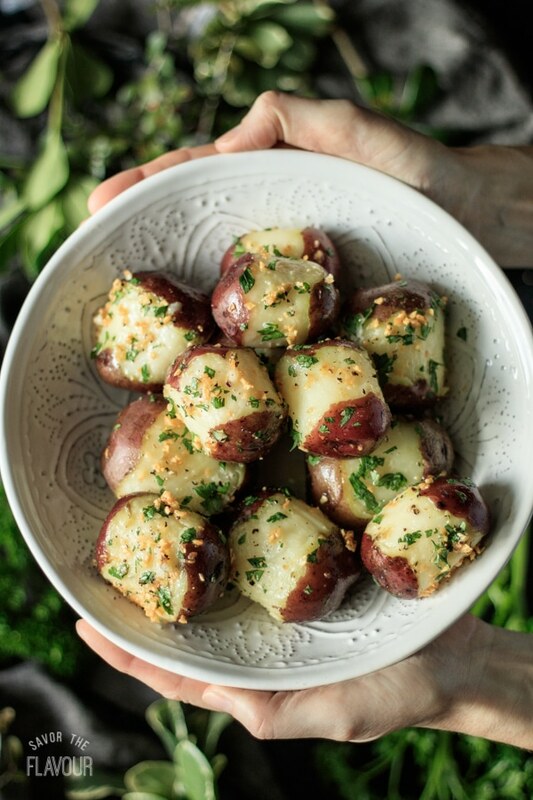 This recipe is so easy, you will want to add buttery garlic parsley potatoes to your family’s side dish repertoire. Start by removing a thin strip of potato skin from the middle of each baby potato. While the potatoes are cooking, brown some butter, and then saute the minced garlic. Next, chop up the fresh parsley. Once the potatoes are fork tender, drain and toss with brown butter, garlic and parsley. Make this dish for your loved ones tonight! It’s quick, economical, and very satisfying. It would taste fantastic with our chicken fricassee. Scrub the twelve baby potatoes. With a pairing knife, carefully remove a wide band of skin from the middle of each potato. Place the potatoes in a large dutch oven and cover with water. Bring to a boil, then reduce the heat and continue cooking until the potatoes are fork tender, about 20 to 25 minutes. Drain and place in a large bowl. While the potatoes are cooking, mince two large cloves of garlic and chop up the fresh parsley. To make the browned butter, use a heavy-bottomed, light colored saucepan, like stainless steel. Melt two tablespoons of salted butter slowly over a medium/low heat until bubbling. Swirl the pan, then stir constantly by scraping the bottom to prevent burning. When it’s done, the butter will be golden brown and have a nutty aroma. Pour into a small bowl and continue stirring for a minute to help cool it down. In the same saucepan, saute the minced garlic in one tablespoon of melted butter over medium high heat until fragrant, stirring constantly. Add the garlic to the browned butter. 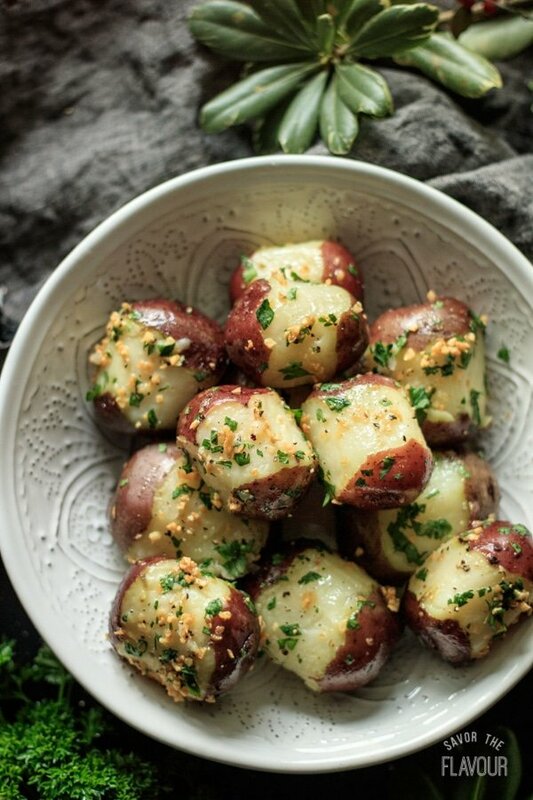 Drizzle the browned butter and garlic over top of the boiled potatoes. 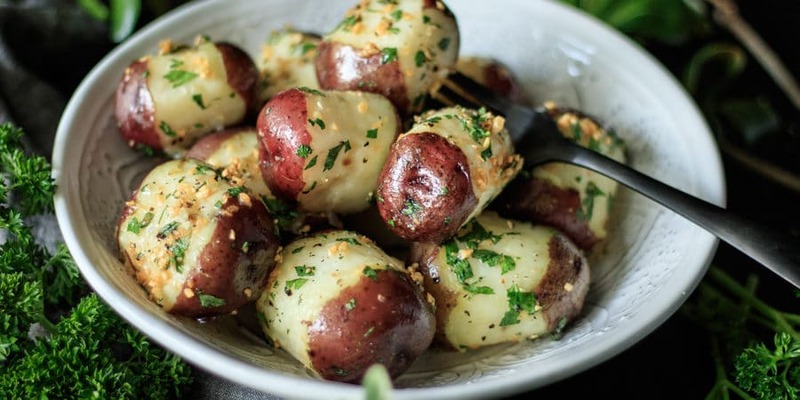 Sprinkle the chopped parsley over the potatoes, then season with salt and black pepper. Gently toss until each potato is well coated and looks pretty. Serve warm. This dish is easy to reheat in the microwave, if you need to make it ahead of time for a dinner party.